What is a Pop-Up “Coloring Bar”? A drop-in oasis to relax and reboot with coloring. The bar is stocked with the very best art supplies and tended by a professional art therapist. Hang out, improve your mood, and take home your own artwork. Most of our coloring bars are FREE or low-fee. • Our first Pop-Up at the famous Strand Bookstore in Manhattan, NY in May 2016. • Brooklyn Kava's Monthly Coloring Bar events were featured on French television. Who can hang out and color? These are adult-only events for ages 18+ years old, unless otherwise noted. What does it cost to drop-in and color? The Coloring Bars are a FREE public service. Bring your favorite coloring supplies or use the high quality donated supplies provided, or purchase supplies and books on-site! How is this different from PaintNite® or a paint your own pottery place? Well, for one thing, it's usually FREE (sometimes we may charge a very low entry fee). It's also different because you don't have to worry about producing a final product. You can just zen out and color. You can come alone. You don't have to make a reservation. You don't have to follow instructions or have a plan. It's more like a spa for artmaking and relaxing. And, if you want, socializing. Also, each location will always have a trained, professional art therapist on site to help you deepen your art making experience. Make it meaningful! Our very first pop-up coloring bar was hosted by the legendary Strand Bookstore in Manhattan on March 26. It was overwhelmingly popular, with a wait list to rival a popular restaurant in the city. A big thanks to all of you who waited your turn to color. For those who were turned away, our next events are right around the corner. Stay posted!! We have to give a big thanks to our colleague and friend, Natasha Shapiro LCAT, ATR-BC who has her own art therapy practice in Tribeca. Natasha's had this idea brewing in her head for a few years, long before coloring books were hot. She generously shared it with us and is part of our team of art therapists working behind the scenes to turn the Coloring Bars into a reality. You can visit Natasha's therapy website here and see her personal artwork here. Can I commission my own private coloring event? 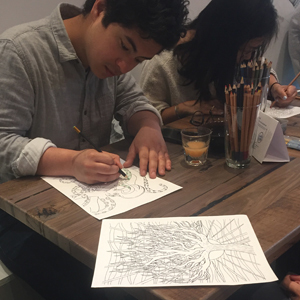 Stay up to date on upcoming Coloring events in and around New York City on our community page. Our mission is to offer a series of public service and community building events in the form of free or low-fee drop-­in locations that raise awareness of art therapy, adult mental health and the wellness benefits of simple and accessible art projects. The pop-­up Coloring Bars will ride the wave of the adult coloring book phenomenon-­-­which has been widely publicized in most major news outlets.